He’s almost as prolific with his political and social activism as he is with recording. 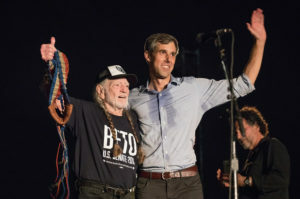 We’re talking about Willie Nelson, who seems to have alien-level energy and time on his hands – enough to drop two full-length albums this year (his, get this, 67th and 68th) as well as throw his tattered old guitar into the political ream in time for next month’s mid-term elections. Nelson – whose public activism formally kicked off with the co-founding of Farm Aid in 1985 – has previously put his efforts into marijuana reform, animal rights support, LGBT activism and environmentalism, to name a few. Now he’s going all in on the effort to dethrone Donald Trump. And he’s starting with the most immediate concern: Changing the power balance of the Senate by swapping out a few Republican incumbents for a few Democratic challengers. In that vein, Nelson, 85, has been campaigning on behalf of current Texas Rep. Beto O’Rourke, who is seeking to take over Sen. Ted Cruz’s seat this coming November. Like the concept, the lyrics are pretty straightforward. And whether you agree with the message or not, you have to admit it’s pretty catchy – catchy enough to earn the top spot on this week’s collection of New Tracks on the Trail. 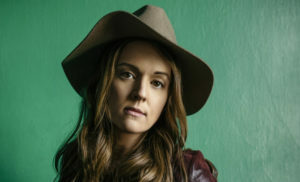 • It felt like Brandi Carlile broke the airwaves when she dropped the first single off her sixth studio album, By the Way, I Forgive You, earlier this year. That one, “The Joke,” was so obvious it sounds like it must be a cover of a classic. But that’s what separates the rockin’ girls from the rockin’ women, right? Now, another one from the album that peaked at No. 1 on both the US Folk and Top Rock charts. Released in February, By the Way, I Forgive You was co-produced by Nashville giants Dave Cobb and Shooter Jennings. If you missed it, check out this video of Carlie’s tribute to Aretha Franklin at last week’s “CMT Artists of the Year” special. • We’ll also take a second look at the latest from Death Cab for Cutie. Released in August, Thank You For Today marks the band’s ninth studio release – and first without longtime guitarist Chris Walla. We’ve already played “Gold Rush” from the album Pitchfork has called Death Cab’s “strongest of the decade.” Now, another one. • It’s been 17 years since Michael Franti released his breakthrough album, Stay Human. And now finally we get the sequel. Released as a companion to Franti’s new full-length documentary, Stay Human Vol. II – due in January – features 14 tracks focused on the different ways people around the world learn to cope. One of those ways is love, and Franti explores the emotions he shares with his wife and children in the album’s first single. Check out a recent Billboard profile of Franti’s new works HERE. • English rock band Echo & the Bunnymen broke their four-year recording fast with the release of their 13th studio album this month. 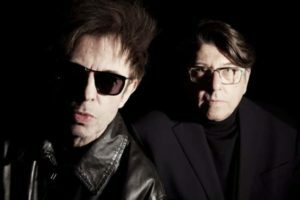 The Stars, The Oceans, The Moon – which features founding members Ian McCulloch and Will Sergeant – is built around a baker’s dozen of reworked classics from the band’s 40-year tenure, with the addition of two entirely new recordings. The album marked their first entry into the UK Top 40 chart since 1999. Check out the rest of that interview here. • Finally, a new single from the upcoming eighth studio release from Richard Lloyd. The former Television guitarist has been working solo – and on collaborative projects – since the band he founded broke up in 1978. This new one, the follow-up to 2016’s Rosedale, was recorded in Nashville with a quartet of musicians he’s been aligned with for decades. The Countdown is due Nov. 2, the same day his 2017 memoir, Everything is Combustible, comes out in paperback.